It appears that GM and Cruise are moving forward with a production-level autonomous Chevrolet Bolt EV. Back in March of 2016, General Motors took a huge leap and acquired 40-employee, autonomous vehicle startup Cruise Automation for some ~$600-700 million. Since then, it has been no secret that the joint effort was slated to become one of the leaders in the space. In addition, we’ve been made well aware that Chevrolet and Cruise are taking their time with development and production efforts for the self-driving Chevrolet Bolt EV to assure that they get everything up to par. Now, we may be seeing some substantial progress. If you’ve followed the stories in the past, it was clear that the self-driving Chevrolet Bolt EVs were in the early stages of development. This is not to say that the technology was behind — in fact, it has seemed far ahead of others — but instead, the cargo area was full of bulky computers and equipment and the cars were outfitted with large LIDAR systems on the roof, exposed cameras, and radar on the side mirrors. While this situation may have been okay for some applications or perhaps even certain fleet vehicles, we’d hoped that there would be an autonomous Bolt EV at some point that did away with the excess baggage. Well, recent spy shots prove that this is truly becoming a reality. Check out the self-driving Chevrolet Bolt EV sans obtrusive LIDAR. It also doesn’t have the radars on the mirrors or any obvious cameras. Moreover, GM Authority notes that the driver is clearly using his phone with both hands and not touching the steering wheel at all. Let us know about your further observations and thoughts in the comment section below. 33 Comments on "Cruise Automation Chevy Bolt Spied Without Bulky LIDAR"
the future is already here and GM is leading the way! Hope they keep it in development until it is trustworthy. Or better yet, deploy it like Tesla as soon as it shows the ability to reduce accidents. This is not a level 2 system where the driver can and has to step in to avoid accidents. This is full self driving and they better be sure it’s safer, than a human being when they release it to the public. Good improvement. The four shark-fins on the roof give it away though. LIDAR has been dropping in unit cost at an exponential rate. The form factor is way smaller as well. I read somewhere about a solid-state LIDAR which may be what they are using here. But then they’re in the wrong place, and need lenses. On the roof, and looking like that, multiple GPS/cell antennas for high precision location is my guess. That’s a lot more believable. Yeah, those are totally the wrong shape for any sort of lidar or radar sensors. Seems to me the best place for active scanners such as lidar or a phased-array radar would be as high on the vehicle as possible, which means mounted on/in the roof. But I can certainly see why, for reasons of style, auto makers want to place them further down and integrated into the main body of the car. Almost as nice as Tesla. They have had their’s integrated so you never know it’s there. Others are trying to catch up. Cruise does work well so it’s time to reduce size and cost. To the best of my knowledge, Tesla does not use LIDAR: they use a radar-based system. And cameras and Teslas crash into fire trucks. It is Tesla that will be doing the catching up soon I suspect. Tesla is already way behind GM/Cruise and Waymo in the self driving front. I’m afraid that’s correct. By refusing to use active scanners such as lidar or phased-array radar, Tesla appears to be dropping further and further behind in the race toward full autonomy. At least, it looks that way to me. There is a huge difference between geofencing and the real world. For full fsd gm would gave to map the whole world. Let’s see in a couple of years who the winner would be. Mapping is easy. Driving is hard. Where did they hide everything? Perhaps there are multiple solid state lidar scanners embedded in the main body of the car, pointed in various directions. It looks pretty dusty in back. Were they testing it on gravel roads? I hope that isn’t the final design. It looks like they stole the front end off an Aztek. Was wondering what happened to the smarter front end used on the regular Bolt. It looks like the front lower bumper area is pushed out farther than the regular Bolt. Like they packaged alot of extra equipment in there. This may be the 2020 Bolt EV refresh design. They are starting to lose the fake grills that ICE drivers expect. Looks fine to me. So, no lidar. Probably a radar in the front lower bumper, but everything else seems optical. Then again there are an odd four ‘shark-fin’ antennas on the roof. What’s up with that? My guess: high accuracy differential GPS. The robo-driver will work only on high-resolution pre-mapped roads, and Cruise Central would have control where you could turn it on and where you couldn’t. It won’t work in a tunnel. 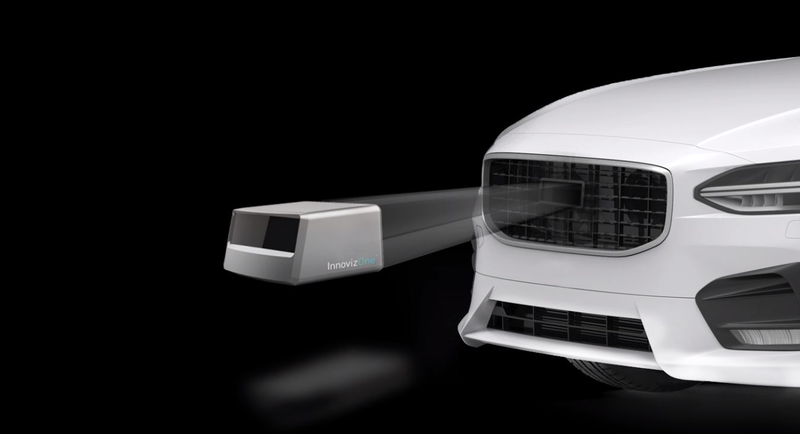 LIDAR is still central to Cruise Automation’s system, it’s now just better concealed. Those fins don’t look fat enough, even for solid state LIDAR. I linked to a pic of Strobe’s early prototypes, but my post went into the moderation twilight zone. The front clip has plenty of room for a Strobe unit. This car may simply be testing that unit’s ability to look forward. That’s enough to drive in many conditions, especially with high precision GPS for lane-keeping. It wouldn’t work for cross traffic, though. could this be a SuperCruise enabled Bolt EV, instead of a Cruise Automation AV? Thanks! I belatedly came to that realization myself. If the only reason this car has been identified as a fully automated self-driving car is because someone spotted the (non-)driver using his cell phone rather than using hands-on driving, well you can do the same with Cadillac Super Cruise. Not that this is safe, since (just like Tesla AutoSteer) the car isn’t capable of “seeing” solid obstacles in its path when driving at highway speed; but that doesn’t prevent drivers from foolishly letting the car drive itself without oversight! Maybe this is nothing more than GM adapting Cadillac Super Cruise for use in the Bolt EV. Maybe the car doesn’t have any lidar or phased-array radar scanners at all.